friends who also decided to stay put. a festive Easter lunch with my family, including a lot of playtime for little C.
made banana bread many, many times before. use plenty…depending on the situation***). bread) without anyone filching 1, 2, or more is quite a feat. run heroics to get what was lacking, I was able to make this. And share it here with you. walnuts. Cover and set aside in the fridge while you get on with your batter. at medium speed until incorporated. their sides and cool to room temperature before removing and slicing. yourself and gift one to a friend, making it, in my book, all the more perfect. Warm Easter greetings to all who celebrate it! And for those who don’t, a wonderful weekend all the same! ***A quick round up of my previous banana bread posts (one for every situation!) can be found here. Zamboanga chorizos? I've never tried these! What makes 'em uniquely Zamboanga? 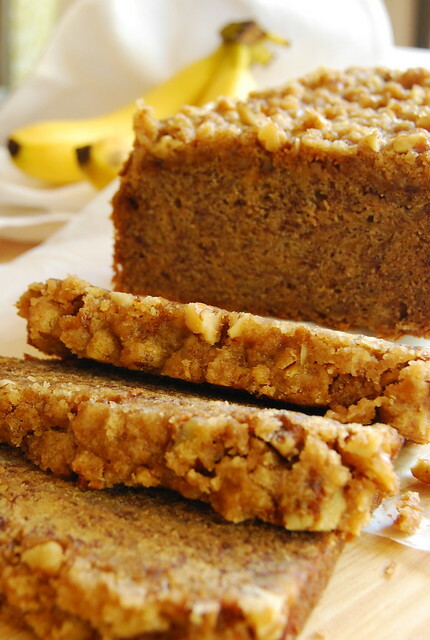 You had me at the streusel topping – no wonder this is your favorite banana bread! Sounds yummy! Hi ShreejaN! Glad you liked it! I had a great and stress free weekend. I made this yesterday and it was very delicious. Serendipity! I recently moved and am not completely unpacked so can't find my banana bread recipe. Gonna give this one a try. I love banana bread! Especially the moist tops. pan de manila carries "bananamon".. it's banana bread with a rather fluffy texture, with a crumbly, sugary top. will do for a quick snack. Hi WizzyTheStick! Hope you like it! Oooh! Shrimps with Alavar sauce? What is that? Sounds delicious…Hahaha, that one caught my eye! I think baking is worth it despite the sweltering heat; it's such a great stressbuster. Oh, and that banana bread looks totally scrumptious! Wow! this looks really a yummy one to try out as I'm a banana lover. Hi Jo, Can I still bake this without a stand mixer?